A wise tech junkie recently told me, “Facebook and Instagram will slowly phase out as society paves its way for the next generation of highly digitally-apt kids – to them, it’s old school.” But will we really? Two weeks ago, a Polish couple fell off a cliff while trying to take a #selfie, right in front of their children. Click here to read article. In the same month The Huffington Post reported “How a Dozen Parents and Children Killed a Shark for a #selfie”. Yet again (on a more hilarious note), a woman’s iPhone got gobbled up by an elephant when she got up close to snap a photo (the video of which is making current headlines on YouTube). All one has to do is Google to delve more into an increasing number of reports of such cases. … giving us more than enough justification for this light-hearted post dedicated to (none other than) photo sharing site Instagram on how we think it has changed the way we Think, React, and Interact. Instagram is in Our Conversations. On a recent travel trip overseas, my friends and I chatted about everything under the sun, with Instagram averaging an estimated 40% of our conversation arena. We were on 3G sim cards, instagramming on the go, and sharing with each other about “Blogger X’s chio Instagram pics” or “Friend of Friend’s boyfriend pics”. We helped Q-C one another’s photos, to ensure flawless editing and perfect captions, before they went “live” – on Instagram. When we were silent, it was because all of us were on our phones – checking WhatsApp, scrolling through Facebook’s feed, checking out other friends’ Instagram photos. Everyone was on their mobile phones so rampantly, we had to set a “no-phone dinner policy”, to ignite conversation between us that was off the topic of social media i.e. the upcoming birthday party of a friend. And even then, we couldn’t leave social media behind – because RSVP to his birthday party was done via Facebook. Unknowingly, I was doing research for this article – without knowing it yet. If I go to a party with you and you take a #selfie of us and Instagram it, I’m expected to like that photo (or any photo that contains me on your Instagram) – there are no rules, it is. Just. Understood. If I am within your radar of close friends, it is an unspoken rule for me to “Like” at least more than half of your Instagram photos (assuming I’m a seasoned Instagrammer and I do see your photos) on the basis of friendship, even if your photos aren’t picturesque, “like-worthy”, or “instagram-worthy”. Liking less than half disqualifies me from your list of “close friends”. If you do not routinely receive “Likes” from a particular someone on Instagram although the person is on Instagram, liking your shared friends’ photos, (and following you), then yes, clearly the person has a problem with you, or he/she genuinely doesn’t like your photos. #sadtruth – but hey, it happens to all of us. Renowned bloggers all have the ability to edit the creatives of their #OOTDs superbly well, making every photograph an “Instagram-worthy” one. As a result, many (especially girls) spend their lives chasing “The Blogger Dream”, wanting to pursue a life that was built largely upon living vicariously through bloggers. Whilst in the pursuit of this dream comes envy, admiration, and desire. Instagram is a Language commonly spoken across the globe. Even in Russia. In the course of my work I’ve recently had the chance to interact with bloggers from all over the world – Singapore, the US, Australia, Asia, and most recently, from Russia. 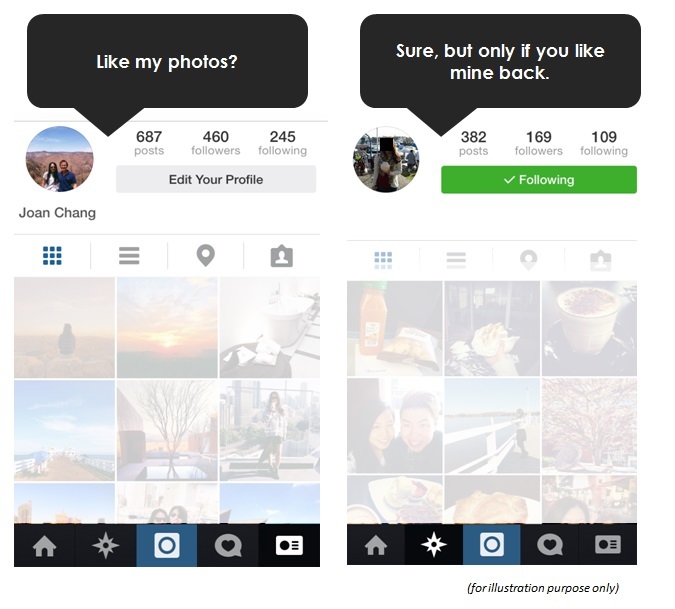 She doesn’t speak English too well, but there are three words we have in common – You speak… Instagram? *nod*, Likes *nod*, and “Followers” *nod*. I’ve unfollowed someone because I found her annoying. I only like the photos of friends who like mine back. I stalk someone on Instagram but dare not follow her because I don’t want her to know I’m stalking her. I like people who like my #OOTDs and dislike people who don’t. I’m friends with people who like my photos and aren’t with people who don’t – it means they aren’t my true friends. If you’ve answered yes to any of the above, then, yes, Instagram has affected your way of friendship interaction, unlike in the past where it was based solely on personal interaction. Instagram created a whole new business market. Bloggers. Businesses selling Instalikes. Media agencies paid to do insta updates. Instagram businesses are sprouting up all over the place – and woah, people are making money from it! One can instantly purchase Insta-likes for $2.97 (100 likes) and 10000 followers for $69.99 – pick and choose your yoghurt topping: real followers or robot followers (half the price) and get them delivered to your doorstep (I mean, Insta-doorstep) within 2 days. This whole article set me thinking on a train of thought of how much of my own life is devoted to Social Media. While I am rarely people-stalking on Facebook (hate scrolling through the newsfeed as I hate how it is never-ending), I do scroll through my Instagram at least two or three times a day, mostly during time-filler moments – on the way to the washroom, on the way back from the washroom, en route home on the mrt, waiting for friends etc. you get the picture. It’s like a daily time-filler app ingrained in me – and in my life. I also have an OCD about Likes that add up to an odd number e.g. 21, 27, 29, and am most jittery when the number is 29, 39, or 49. A part of me has this theory that we love to share and post our lives on social media not so much solely for the thrill of sharing or updating our friends, but more of the secret rush and adrenaline that we all get from those buzzing notifications on our mobiles (1,2,3,4… 10 likes) but all try to be nonchalant about. Sure, there are some who genuinely can’t care less (my boyfriend – the perfect example), but admit it, most of us social media fanatics do. Although, if you think about it, there really is no need to be coy and nonchalant about it because there is nothing wrong with relishing in likes. I could list exceptions to the rule here (i.e. Crazy Stuff People Do To Get Likes) but that is another post altogether. Although my pull notifications are switched off, I do feel a twinge of happiness (there is only 1 word to describe the feeling) when I log into Instagram and see that I’ve many tiny hearts at the bottom of the screen a.k.a. Likes, waiting to be clicked. Disclaimer: This article is meant to be read tongue in cheek. The author holds no claims to any of the justifications and opinions made in this article – if ever intended to be held liable.